The Coal Thief is perfect and polished in so many ways and for so many reasons. You will be moved before you even open the cover. The young boy with his big brown eyes and arms full of coal will capture the hearts of young and old. Every illustration brings a part of history to life with the abundance of details. My second-grade students notice something new every time they read it. 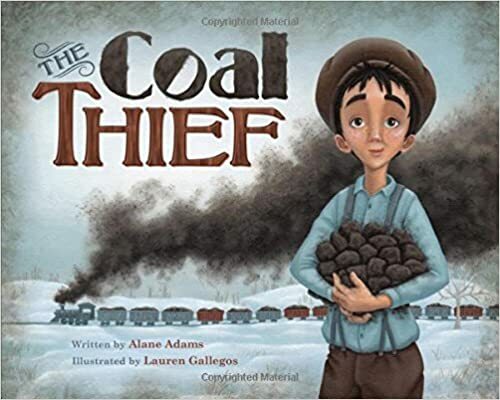 The Coal Thief is an ideal cross-curricular, multiple grade-level mentor text. · Language development through the rich vocabulary (trotted, scowled, trundled, sagging, shivered, etc.) and descriptive phrases (black gold, swallowed him up, craned his neck, turned tail and run, feeling the shame curl his toes, his heart felt so warm, etc.). · Reading with character voices by using the dialogue between Harley and Georgie, and Papa and Georgie. · Crafting a lead by describing the setting. · Character traits – Georgie and Papa are such well-defined characters. · A history lesson by looking into what life was like in the 1920s when times where tough. Not only is this book wonderful for teaching children about staying true to their values, but also the story shows how Georgie (the boy with the big brown eyes) has parents that guide, model and love unconditionally. A reminder all parents can draw from. Alane Adams and Lauren Gallegos have created a monumental book that is a great addition to any school, classroom, or home library. 5+ stars!!!! !